The Court-Martial of Charlie Newell is a story of a poor African-American farmer living in the South during World War I. While the war rages on, Newell and his friends enjoy the fairly peaceful life of sharecroppers. Many of the residents, including Newell have registered as conscientious objectors, but that doesn’t stop the Government from drafting them. When Newell and two of his fellow church members refuse to report for duty, Sherriff Titus Morris and his Deputy August Bird show up in Holly Ridge, the home of Newell, and go to the small dilapidated church to seek the help of Reverend Gomes. After several hours the Reverend brings the three men to the Sheriff who then transports them to the military authorities. The three men are eventually brought to Fort Caswell on Oak Island, North Carolina. The three are assigned to the Quartermaster Corps and given the duty of maintaining the horses and stables. Newell’s religion forbids him from working on Saturdays, his Sabbath, and so he and his two companions refuse to clean stalls on Saturdays. Instead, they are willing to work on Sundays. This unusual arrangement irks their NCO, Sergeant O’Callahan. He insists they must work on Saturdays but when the Sergeant discovers that they are keeping the stables in better condition than any others assigned to the duty, he relents and allows them to work on Sundays and hold Saturday as their religious day. Lieutenant Colonel Albert Chase is not so inclined. According to Lieutenant Chase, no soldier, especially a “colored” soldier, should be allowed to bend the rules. The Colonel consults with the Command Judge Advocate General to see what kind of Court-Martial might be appropriate for insubordination and asks that a General Court-Martial be pursued. Chase has Newell brought to his office, and in the presence of a group of officers and his recording secretary issues an order for Newell to work on Saturday. Chase knows that Newell will refuse this command, and when he does, Chase is able to formally pursue Court-Martial charges. After the Court-Martial, Newell is sent to Fort Jay on an island in New York harbor to serve ten years at hard labor. For a black soldier to serve hard labor with so many NCOS from the South was incredibly harsh. He is tormented, abused, spit at, and must endure racial slurs by guards and inmates alike. Every day is a test of Newell's inner strength as he tries to survive long enough to return to his beloved farm. The author, Gerard Shirar, acknowledges serving in the army during the Korean War when the military was integrated by order of President Harry Truman. As a Korean War vet myself, I know that the transition from the army of earlier times to this later time was a radical departure from what was acceptable and usual during World War I when Harry Truman had served in the military. This story is very skillfully and carefully crafted and presents many of the characters one would have encountered when serving in the army at that time. Shirar artfully includes military personnel who range greatly in their treatment of others, from the cruel and heartless officers to those who remain silent when they see others abused. As the story progresses, Shirar does a good job of developing the characters Newell encounters, both good and bad, and both white and black. 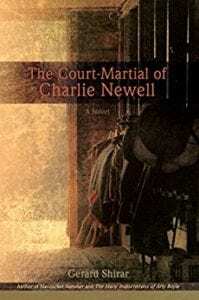 The Court-Martial of Charlie Newell is a story that might well have happened and is historically important to remember. It is written in such a way as to make the whole series of events believable. Perhaps it is because of his background in law and the military that has allowed Shirar to create such a vivid and realistic story. Regardless of the reason, he has done an outstanding job of storytelling and is to be commended. Quill says: This tale is outstanding and thought provoking and is suitable for all generations.